well another new wall from me xp not much of a surprise actually ..
so I added some flying feathers ! looks very pretty. and yeah the scan is cute. cool effects. you did a nice job!!! The design is fairly neat. I really don't advocate the parts of the wall that are supposed to be solid, such as the birds and the feathers, but if this is supposed to be some sort of dream, then I guess they're okay. The text on the bottom is very big and disturbing, not to mention that it doesn't seem to match up with the type of wall you created; the Scriptina font seems to work a whole lot for these walls. One thing you could do, since the girls are in the windy cold, assuming that they're freezing, is that you could place a layer of the color of ice on top and set the blending mode to color. Personally, I like the top of the wallpaper better than the bottom because it looks like an icy effect with the background looking like ice as well. However, the remaining snow effects and the matching colors are good. the charas look ok. i like the effects and the bg itsellf. the colors and everything look pretty good. It's really nice ^^ I like the scan and the colors. 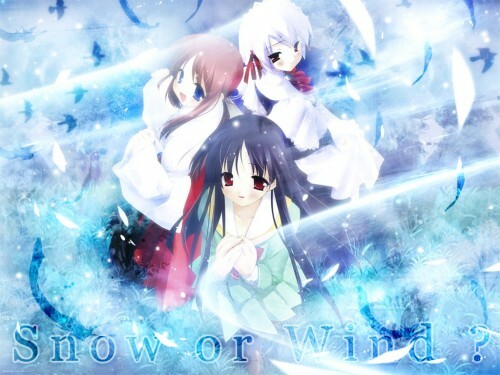 The wind effect is nice and I like the birds and the feathers ^^ Good job! It is very very nice ... the scan N the Colors... where matches the kawaii..girls^^!! Great Job! !